1Pharmacognosy Division, Drug Standardization Unit, Dr. D. P. Rastogi Central Research Institute for Homoeopathy, A-1/1, Sector 24 Noida, Uttar Pradesh-201301, INDIA. 2Medicinal Plant Garden Unit, Center for Medicinal Plants Research in Homoeopathy, 3/126 Indira Nagar Emerald, Tamil Nadu- 643209, INDIA. 3Drug Standardization Unit, Central Council for Research in Homoeopathy, D Block, Janakpuri, New Delhi- 110058, INDIA..
Background: Hygrophila auriculata (Schumach.) Heine synonym Hygrophila spinosa T. Anderson is used in the homoeopathic system of medicine belongs to the family Acanthaceae. Plant contains terpenoids, alkaloids, flavonoids and is traditionally known as an aphrodisiac, renal tonic and for its health-promoting properties, this drug is most popularly used by homoeopathic practitioners for the treatment of urticaria, conjunctivitis, gastroenteritis, nausea etc. Complete morphological characterization of whole plant has not been reported so for. This study may provide complete information on the basis of morphological, anatomical and powdered studies. That will assist to differentiate between adulterants and authentic raw drug to maintain the quality of drugs. Objective: The aim of the present study is to examine the morpho-anatomical, powder and fluorescence analysis of whole plant i.e. root, stem, and leaf of the plant used in homoeopathy. Material and methods: The macroscopical, microscopical and powdered analysis of drug was performed. For morphological study simple observational methods applied while for anatomical and bio-statistical parameters microscopy including powder microscopy was performed by using different methods. Results: The drug was in form of dried pieces of leaves, small quadrangular pieces of stem with spines and roots. Microscopy showed few features like aerenchymatous cortex in the middle region of root; semi-quadrangular outline, four vascular bundles at each corner in young stem and developing fascicular vascular bundles between them, in mature stem 6 vascular bundles viz. 4 vascular bundles at corner and 2 vascular bundles present in between opposite to each other; broad cortical aerenchyma in mature stem, leaf amphistomatous, anomocytic stomata, crescent-shaped meristele in leaf. Conclusion: Present study can assist the diagnostic characters of Hygrophila spinosa may be taken as pharmacognostical standards for the identification of plant drug. Verma D, Singh S, Arya R, Rajan S, Arya BS, Khurana A, et al. 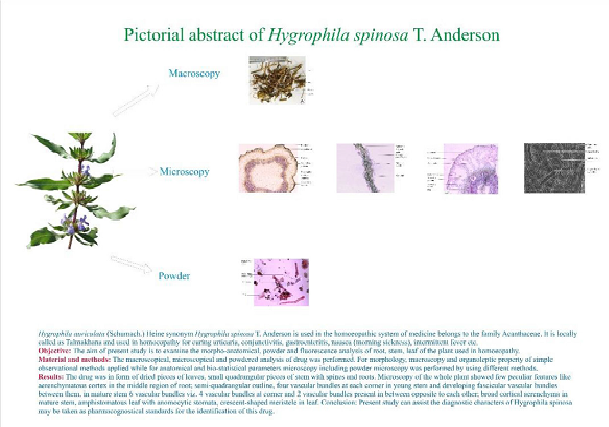 Morpho-anatomical Observations on Homoeopathic Plant Drug Hygrophila spinosa T. Anderson. Pharmacognosy Journal. 2019;11(2):286-291.